Did Joe Biden Just Ask Me Out on a Date on the David Letterman Program? I THINK SO. I mean, I can't be sure. But he definitely said something about a cheeseburger and "finding someone special." Sooooo…I can read between the lines, Biden!!! No. 10: "I'm not saying each voter gets a free cheeseburger, but I'm not saying they don't either." No. 6: "If you vote early, you don't have to pay taxes…I'm sorry, I'm being told that's not accurate." No. 5: "Single and looking to mingle? 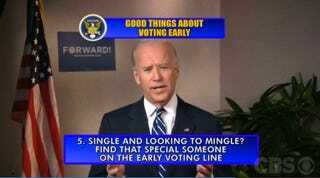 Find that special someone on the early voting line." No. 2: "Early voters will receive a $5 million donation from Donald Trump." "Honestly, don't you want this election over with already?" Depends. Will you still be on my TV being hilarious?